Jonathan's friend Andy had his girlfriend in town this week (she lives in NJ), so the four of us went to Union City to have Mongolian food at Little Sheep Hot Pot. While Jonathan and I have been wanting to try 'hot pot' since we went to New China Delight, and this was definitely a place we probably wouldn't have wanted to try alone. We didn't really know how to order, so it was a good thing we had Andy and Kristine. 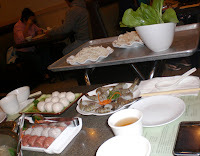 For anyone who might not know, Mongolian Hot Pot is kinda like an Asian Melting Pot. There's a burner in the middle of the table, and the server puts a big bowl of soup there. You can get original, spicy, or a divided bowl with both (which we went with). You also check off a front-and-back sheet with tons of different meats and vegetables. We got a beef and lamb platter, tiger prawn shrimp, cabbage leaves, pork dumplings, king oyster mushrooms, cuttlefish meatballs, udon noodles (really thick) and an assortment of pork/beef/shrimp meatballs. The way it works is where the 'Melting Pot' part comes in... all of this stuff is raw. You use tongs to grab the items and toss them into the broths to cook them, either just in there or on little ladles (mostly for the smaller items and to fish everything out again). 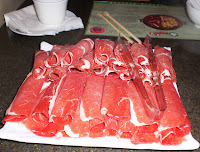 The beef and lamb were both good (especially in the spicier soup). The tiger prawns were only okay... it was a little plain since there were not herbs or anything on the shrimp. Jonathan ate the bulk of the cuttlefish balls... I found them a bit rubbery. I really enjoyed the shrimp meatballs, and the others were a hit with the group as well (although I should note that they took much longer to cook than most of the other items). Make sure not to keep the mushrooms in there too long or they get rubbery. The pork dumplings were my favorite, although they did take a while to cool after pulling them out of the pot. I didn't care much for the cabbage leaves, but everyone else liked them quite well. While I am a fan of pretty much any type of pasta, the udon noodles were definitely delicious, and I am glad that we added them on at the last minute.